Spot coolers: what is Spot Cooling? • The Air Geeks, reviews of air conditioners, dehumidifiers and air purifiers. 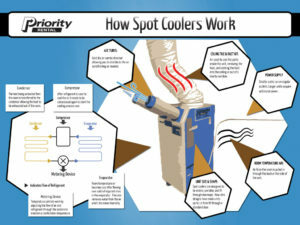 Blog, Portable Air Conditioners » Spot coolers: what is Spot Cooling? 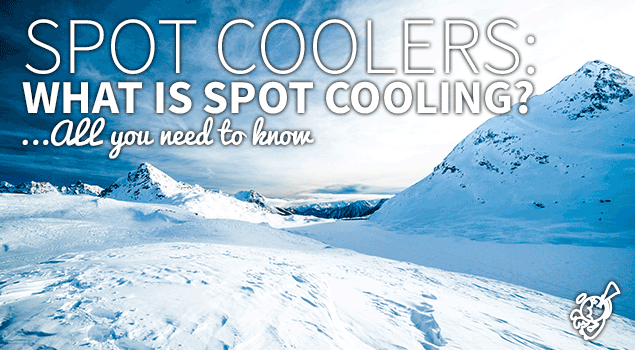 Spot coolers: what is Spot Cooling? Air cooling solutions come in different designs, brands, and sizes and they are all meant to ensure that your space has a truly comfortable environment. Some of the cooling solutions that are commonly used in homes include central air conditioning units, portable air conditioners, air coolers, and spot coolers. Although these solutions differ in some aspects, they have one thing in common: they cool the air in the space where they are installed. Unlike air conditioners, spot coolers are designed to cool a spot instead of an entire room or apartment. This air cooler has components that are similar to those of an ordinary air conditioner. Warm air passes over an evaporator where it is cooled and excess water captured. From the coiled evaporator, cool air is channeled to a spot through a nozzle while the captured water is drained away. The nozzle of a spot cooler concentrates air on a specific place. A self-contained spot cooler integrates a condenser and an evaporator in one container. This design differs from the common central air conditioning unit’s design where the condenser and evaporator are separate. The evaporator of a central air conditioning unit is located within the house while the condenser is located somewhere outside the house. Refrigerant lines are used to connect the separate sections of the air cooling solution. Considering that most spot coolers are self-contained, their air cooling cycle is slightly different from that of a central air conditioning unit. A spot cooler cools the same air in a continuous cycle until the desired temperature is attained.In comparison, a central air conditioning unit draws cold air from outside and pump away hot air. Apart from ensuring that your room has cool air, this system also ensures that the supplied air is fresh. A spot cooler can be modified to operate as an air conditioner. To do the conversion, you need a duct kit that will enable the condenser to draw air from outside and pump away hot air from inside. Does this conversion enhance the performance of a cooling solution? Yes, this modification enables the system to cool a room faster than an ordinary spot cooler. Do you have a spot cooler and you feel that it is performing poorly that you would expect? If your answer is yes, then you should consider converting it into an air conditioner. All you will need is an air duct kit. However, if you are satisfied with its performance, there is no need to incur an extra cost in modifying your air cooling system.